Summary : Pizza from Di Fara is the best thing I've ever eaten. This is hands down my favorite pizza place and will likely be the only pizzeria ever to receive a perfect rating on I Dream Of Pizza. Anyone who has ever visited this site is probably aware of how I feel about Di Fara in Midwood, Brooklyn. Although words can’t do the experience justice, here are a couple that come to mind when I think about the pizza I’ve eaten there: epic, magical, legendary, orgasmic, life-changing. It’s that great. Dom DeMarco’s pies are the best thing I’ve ever eaten. And the food is only the beginning. Watching him make pie after pie is like watching an artist create his masterpiece. Every piece of dough is a blank canvas. What happens next is heavenly. The sauce. The cheeses. The oil. The basil. The toppings. That brick oven. Although I mention Di Fara in write-ups almost every week, I have never written a proper review of the place. There is only so much I can write. In fact, my review should really only be two words: Go there! I talk about pizza with a lot of people. Everyone has their thoughts on where the best New York pizza comes from, but I don’t think that anyone who hasn’t been to Di Fara should be able to engage in a legitimate discussion about New York City pizza. Sure Grimaldi’s is good. And I basically live at Artichoke. But no other New York pizza place comes even close to my experiences at Di Fara. 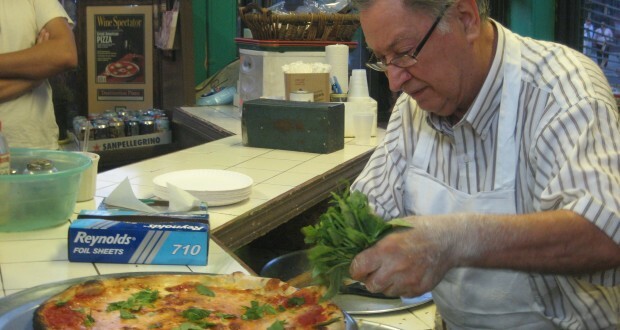 Dom DeMarco has been running the place for 45 years and over the past decade he has become renowned around the world for the pizzas he makes. A pie will run you about $30, which I honestly consider a bargain given the quality and personal attention that each pie receives. DeMarco rolls the dough for every pizza and puts each ingredient on himself. Every pizza is treated equally. He never rushes and those in line are always surprisingly patient. Don’t disturb the artist while he is at work. The place itself is no-frills – a couple of mismatched table and chairs, as well as a few refrigerators with drinks. There is nothing fancy about it. You’d imagine the place looked the same in the 1960s. This week, I made my 5th trip to Di Fara. Each voyage out there has held a special place in my heart. I went on this particular trip with my friend Charles, who has lived in New York City for 27 years but had never been to Di Fara. We often talk about pizza, but it was time he gave Di Fara a try. We got half a plain pie and half a pie with Porcini mushrooms, peppers, and artichokes. Anyone trying Di Fara for the first time should make sure to try at least one plain slice. Each ingredient truly stands out. But the toppings are incredible as well. Just as fresh and tasty as every other part of the pie and the combination that we came up with hit the spot. As my friend pointed out, the imperfection of the pizza is what makes it perfect. It’s not completely round. Some parts of the crust are slightly more burnt than others. Some bites are saucier, some cheesier. But that’s part of the experience. As no further commentary can do Di Fara justice, I will now direct you to the photos and videos below which I hope will inspire you to go there yourself. Right away!